european bioinformatics institute | O'Really? 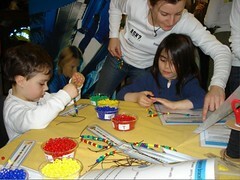 DNA sequence bracelets (see picture right). Thread coloured beads according to sequence sections from a range of organisms including trout, chimpanzee, butterfly, a flesh-eating microbe and rotting corpse flower. Yummy gummy DNA (under 5’s) build your own DNA helix out of sweets and cocktail sticks. Then scoff it all afterwards. What’s my name in DNA? find out what your name is in DNA, and what the corresponding (hypothetical) protein is using software from deCODE. Function Finders translate DNA into a sequence of amino acids using wooden translator blocks, then find out which organism the amino acid sequence is from. Genome sizes (with seatbelts) Rank organisms (inc. human, zebrafish, mosquito, sugar cane and yeast) and find out if they are in the right order. Results are often not what you would expect. Play your genes right. A card-based guessing game which compares the number of genes in the human genome with the number of genes from a range of different organisms include the flu virus, E. coli bacteria, armadillo, rice plant and others. Genome Jigsaws for illustrating the process of finishing supposedly “finished” genomes, by putting together a square sequence jigsaw following base pairing rules to end up with a complete finished square. DNA Time Team examines of aspects ancestry and evolution. The activity encourages people to work out the sequence of a common ancestor by filling in the gaps on a simple evolutionary tree. Spot the difference with proteins. Comparing Heat Shock Protein (HSP) in human and other organisms to illustrate how different regions of the protein vary between different organisms and how this affects function. There were a whole bunch of new activities at the festival this year, maybe these will appear on the your genome website in the future. Anyway, it was great fun to get involved, there is nothing quite like the challenge of explaining parallel computing to young kids, teenagers and their parents – actually much easier than you’d think if you’ve got access to great teaching materials. Thanks to Francesca Gale and Louisa Wright for all the hard work that went into organising this fun and successful event.